Tue., Sept. 5, 2017, 11:58 a.m.
WASHINGTON – President Donald Trump’s envoy to the United Nations laid out an argument Tuesday for the U.S. to declare Iran in violation of the nuclear deal, but suggested the Trump administration might then leave it to Congress to decide whether to withdraw. The Trump administration has been debating for months whether to scuttle the nuclear deal, as Trump threatened to do as a candidate, despite staunch opposition from U.S. allies who negotiated the deal with former President Barack Obama’s administration. Under pressure from both sides, the administration has been exploring possible halfway options, such as declaring Iran in violation but leaving its relief from nuclear sanctions in place at least temporarily. Yet while a U.S. law passed to codify the nuclear deal gives lawmakers some oversight, the agreement is not a treaty. It’s been widely assumed until now that responsibility lies with the White House, not Congress, to determine continued U.S. participation in the deal. Kicking the issue to Congress would also echo the president’s newly announced approach on immigration and another Obama-era program that shielded from deportation some immigrants brought to the U.S. illegally as children. Trump’s administration announced Tuesday the program “was being rescinded,” but Congress would have six months to try to come up with a legislative fix. Under the nuclear deal and the related U.S. law, the president must tell Congress every 90 days whether Tehran is complying with its obligations under the deal, in which Iran agreed to roll back its nuclear program in exchange for billions of dollars in sanctions relief. The International Atomic Energy Agency, the U.N. agency that monitors the deal, said as recently as last week that Iran was complying. The Trump administration’s argument for Iran’s noncompliance has centered on narrowing the lines between pursuit of nuclear weapons, which is forbidden under the deal, and Iran’s other transgressions, like support for extremists in other parts of the region. The nuclear deal was intentionally structured to avoid those issues so the nuclear threat could be prioritized, in what’s become critics’ chief complaint about the deal. But Haley suggested another way Iran could be deemed to be violating its nuclear obligations: its ballistic missile development, also excluded from the deal but still illegal under other U.N. resolutions. “You can call it non-nuclear all you want: Missile technology cannot be separate from pursuit of a nuclear weapon,” Haley said. The Trump administration has faced two of the 90-day certification deadlines so far, and both times avoided the showdown and said Iran was meeting the conditions needed to keep enjoying sanctions relief. But Trump more recently has said he does not expect to certify Iran’s compliance again. The next deadline is in mid-October. 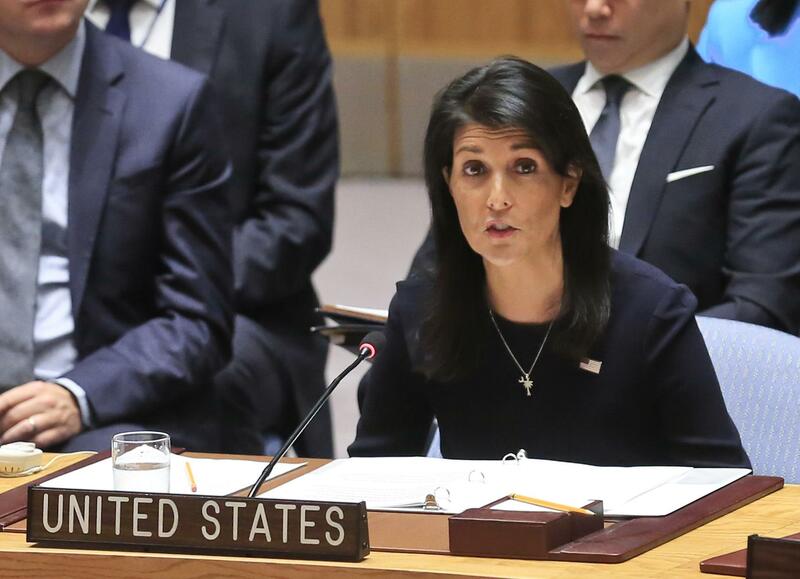 “If the president finds that he cannot in good faith certify Iranian compliance, he would initiate a process whereby we move beyond narrow technicalities and look at the big picture,” Haley said. Published: Sept. 5, 2017, 11:58 a.m.